How good is that? Despite all the crunch, recession, downturn or whatever they call it, the British film industry goes from strength to strength with our films collecting arms full of awards at the Golden Globes, BAFTAs and the Oscars. Remember though that it's not just the stars and directors who deserve our applause, hundreds of back room people make British film great and we lead the world in special effects and technology. Of course Hollywood and the rest of the world are waiting for the really big awards of 2009 - "The Ritzys" - when our very own red carpet will be rolled out again on 6th June to celebrate another great year in the industry. A new Clint Eastwood film is always an event, whether or not he's in front of the camera or behind the camera. In this case it's both - Gran Torino sees Clint as Walt Kowalski, a Korean war veteran who sets out to reform his teenage neighbour who tried to steal his prized 1972 Gran Torino car, nice to see Clint with a rifle in his hands again. Old Big 'Ed is back! The Damned United looks at Brian Clough's 44 day reign as manager of Leeds United - I remember it well, there was nothing else on the back pages of the press for weeks so this will be a big one for us.... book early! A strong British cast include MIchael Sheen aka Tony Blair and David Frost. State of Play is a big screen version of the BBC mini-series of the same name. A team of investigating reporters and a police detective try to solve he murder of a US congressman's mistress; Russell Crowe stars. There's so many good films around this year - come to The Ritz and see them all. Next issue of All Things Local, I'll look forward to the summer blockbuster season. Hot on the heels of publishing Issue 12 (Village Edition of All Things Local) online, we're very pleased to inform you that the accompanying separate Belper Edition (Issue 4) is now also online for viewing. 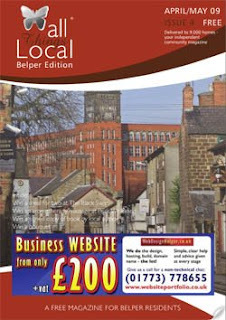 Visit All Things Local website and catch up with 9,000 other Belper Edition readers on the latest news and features. 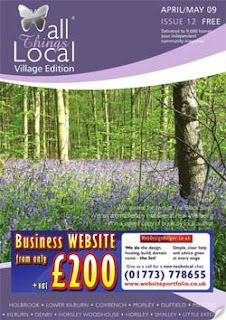 Issue 12 (April/May 2009) - Village Edition - of All Things Local - the popular community magazine covering the Kilburn and surrounding village areas has just been added to the All Things Local website for reading and viewing online. Visit All Things Local website now and click on the current village edition to get all the latest news and regular features 9,000 local readers enjoy.